Jenna wasn’t always big on exercise. But one group exercise class in 2015 changed her life. Within six months, she became an instructor. Now Jenna loves high energy and strength-based workouts that push her and our members. Her love is contagious and isn’t stopping with the mic and studio. 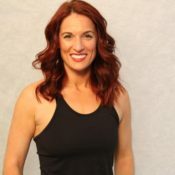 She is currently pursuing her Personal Training Certificate through the National Association of Sports Medicine.Jenna’s Classes: Les Mills BODYPUMP and Power 30.